Here are a variety of resources for French AP that includes a sample syllabus, AP test review, AP themes vocabulary and activities, subjunctive information, francophone article assignment and a list of useful expressions. 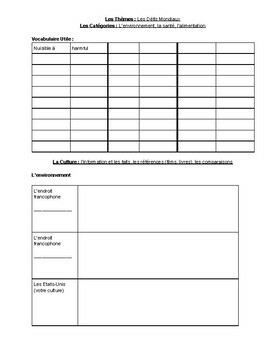 This worksheet is a way for students to review the AP French themes. I divided the 6 themes into categories that I believe make sense together. (For example, I combine health, food and environment.) It requires students to brainstorm related vocabulary as well as the facts they have learned about each topic. It asks them to organize information by francophone location to help review cultural comparisons.